TIGER TALES AND BIG BEAR CLAWS. DOUGHNUT HOLES OR IS IT DOUGHNUT BALLS? POWDERED TREATS LAID OUT FOR YOU. HÜSKER DON’TS OR HÜSKER DÜ? If that doesn’t sell you by itself, nothing will. You probably already know if you’re a Weedeater fan, and they’re not the type of band who need in-depth analysis. There’s little else for me to add but release details. This song is the product of Weedeater’s appearance at an installment of Scion’s monthly show series at the Satellite in LA alongside Pins of Light back in January. Each band that plays one of these shows also records a new song that Scion then presses to a 7″ that they distribute for free at a later installment of the series. “Hot Doughnuts Now” is evidently what they cooked up. 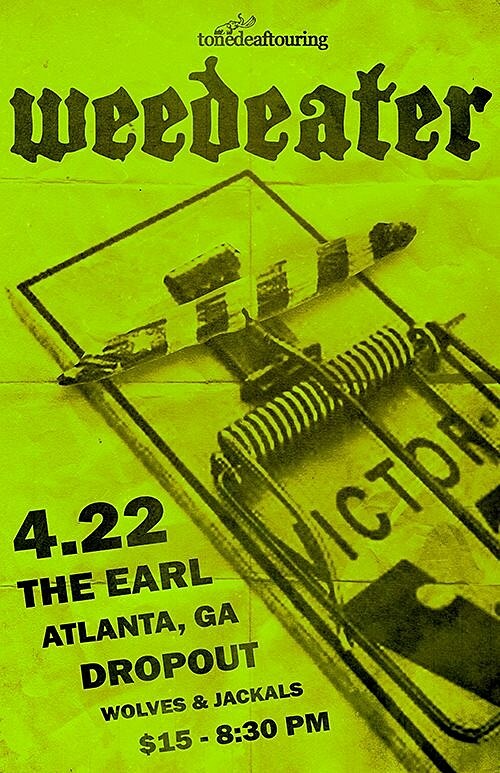 Weedeater are also playing a show in Atlanta tonight with Dropout and Wolves & Jackals. Catch them if you’re in town.